The 47th Bob Evans Farm Festival will be returning the weekend of Oct. 13-15 with a new buffet and amusement park rides. RIO GRANDE – Nearly 30,000 visitors from 18 states are expected to attend the 47th annual Bob Evans Farm Festival from Friday, Oct. 13, through Sunday, Oct. 15, at the Bob Evans Farm in Rio Grande. For the first time, the festival will feature a Bob Evans buffet with signature dishes, amusement park rides and a 4K run/walk. The buffet will allow visitors to try unlimited Bob Evans signature dishes for $12 for attendees ages 13 and up and $6 for children 12 and under. In addition to the buffet, visitors can enjoy a wide variety of food options from vendors throughout the festival including bean soup and corn bread, apple cider, kettle corn, pies, apple dumplings, ice cream, Ohio-made cheeses, trail bologna and other treats. A first for the Bob Evans Farm Festival, the Family & Heroes 4K Run/Walk will be held on Oct. 14 at 8 a.m. The course spans across the village of Rio Grande and the University of Rio Grande and ends at Bob Evans Farm. All proceeds will benefit the USO of Central and Southern Ohio, an organization dedicated to serving U.S. military members and their families. The organization serves 65 counties in central and southern Ohio, West Virginia and northern Kentucky. All participants will receive a complimentary ticket to the Bob Evans Farm Festival. Additional information including registration and race details can be viewed at www.family-of-heroes.com/bob-evans. Another first, this year’s festival will include amusement park rides for all ages. All-day ride wristbands can be purchased for $10 for adults ages 12 and up and $5 for children 11 and under. Performances from lumberjacks and chainsaw carvers, an opportunity to interact with Columbus Zoo animals and farm demonstrations, including herding by Alan Miller’s Border Collies, cow milking with the Laurel Valley Creamery and pig races will also be a part of the festival. Hay rides will be offered throughout the day. In addition, over 100 artisans are set to showcase and sell their work during the festival. Entertainment throughout the weekend will be provided by regional and nationally-known musical artists, including Mad River Railroad, Julie Reeves Band, McGuffey Lane and The Church Sisters, among others. A Kids’ Farmyard Fun area will feature face painting, a hay bale maze, game tent, kiddie train rides, a corn pile and a make-and-take craft station. Visitors can also participate in contests, including team cow chip tossing, corn shelling, hay bale throwing and a pie eating contest. Registration for contests begins at 9 a.m., with the contests beginning at 10:30 a.m. and 2:30 p.m. on Friday and Saturday and 2:30 p.m. on Sunday. The Bob Evans Farm is located on State Route 588 just off U.S. Route 35. Festival hours are 9 a.m. to 5 p.m. Tickets can be purchased at the entrance gate and are $5 for adults and free for children five and under. 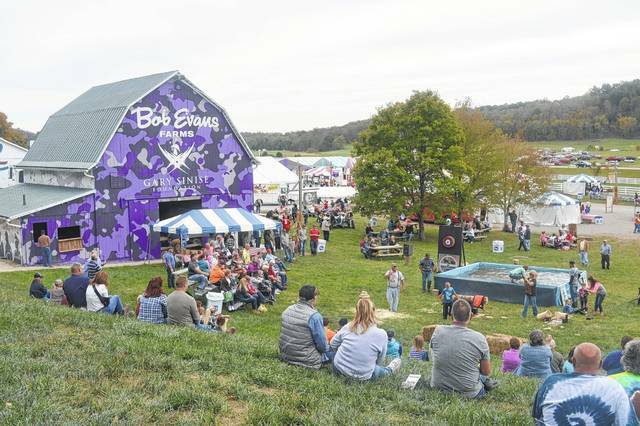 For more information and to view a full entertainment schedule, visit www.bobevans.com/aboutus/the-farm/farmfestival/.